In a previous article, we discussed how to enable an application with Azure AD without making any implementation changes that integrate directly with Azure AD API. With that type of integration, we saw how all of our content is protected under the Azure security platform. We also noticed that there is a limitation when we need to provide anonymous access to some of the resources. In this article, we take a look at how to address this limitation by taking a direct control of the security in our application. This creates a new folder (nodejs-azure-ad) and downloads the code. The code for this article is in the master branch. The simple-auth branch has the code for the first article in which we are only enabling the authentication for the entire app. The first option forces a redirect and does not allow the option to provide anonymous access to any of the app content. When we need to provide anonymous access to some of our application resources, we need to select the second option which allows anonymous requests to pass through. This passes the authorization concerns to our application logic. After we enable the option to Allow Anonymous requests, the application is enabled to receive all the requests. It is the responsibility of the application to determine what should be protected using authorization filters which in turn can redirect the traffic to an identity provider like Azure AD. 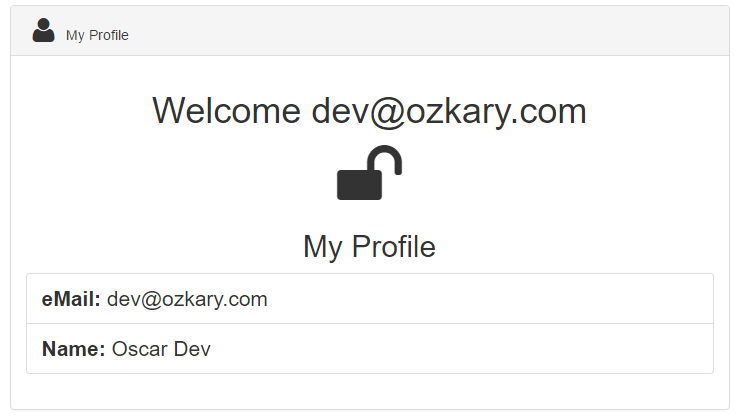 The identity provider is the system that presents the login view to the users. In order to implement our authorization logic, we need to integrate directly with Azure AD. Lucky for us, there are plenty libraries that can help enable our integration. Let’s start by installing a few of those libraries in our application. Run the following command from the command line in the working directory where the code has been cloned. Note: These libraries have already been configured on the package.json file, but these steps are shown to clearly show what libraries are required for this integration. The last library to install is needed for session management. This is what passport uses to manage the persisted user information. This the url that the identity provider service can use to send back the response after the user authenticates. To generate the app key, we need to go back to azure and visit the AD app settings: Azure Active Directory->Application Registration -> APP Name->Settings->Keys. The code above sets the app information, so the strategy plugin can provide the app registration to the Azure identity provider. In the callback url parameter, we need to add a route, so we are able to write a handler for the callback. In this case, we add the onauth route for which a handler is implemented by our modules/route.js module which is cover in a coming section. The anonymous method on the oauth strategy is called when the authentication is successful. It receives the profile information which is a Jason Web Token (JWT). By calling the done callback with the user context/profile, we are passing the execution to the strategy userProfile handler which takes care of parsing the token and reading the claims from the token. This is the area of the code where we need to transform JWT format into our custom user context JSON format. Note: The authentication process is started by calling password authenticate in our authorization filter code. We can see this implementation in the Authorization Filter section. Once our user context is created, we call the done callback with the custom model. This passes execution to the passport serialize user function which is the area where we should add the user information to a session storage. In our example, we are using in-memory hash table to illustrate the process. On our server code (modules/auth.js), we need to add the handler for the passport strategy token params. This sets passport with the resource Url which is used to get the authentication token. The deserialize user function is used by the passport session management process. The main purpose is to fetch the user context from a local cache to set the request as an authenticated request. This is what enables our authorization filter with the session/user context to allow access to the authorized areas of our application. When the request is authenticated, we just return next which allows the request to continue. If no user context was found on the current request, we force the user to login by calling passport authenticate. This is the entry point for the passport authentication management process which consists of a series of redirects to the Single Sign On page presented by the identity provider system. We have two protected routes login and api/user. The login route starts the login process for the user. If the user is not logged on, the application uses the passports authorize filter to start the login process via HTTP redirects. This route is called from the login button on the client application. We should also note the onauth route which is our handler for the response from the identity provider after a successful login. On the handler, we call the passport login function to process the information and transform the token into our user context via the serialize user passport function. We are now able to compare two possible integrations with Azure AD. When we select Login with Azure AD, we discover that Azure protects our application entirely and does not allow for any type of anonymous access to our resources. In some cases, we need to provide the anonymous access and only protect some of the resources like API and/or server side controllers. For that scenario, we show how to select the Allow Anonymous Requests configuration option, use the passport libraries and Azure OAuth integration to take more direct control of our security. We should note that the integration approach to take should be based on our application requirements. When writing RESTful APIs, we often used the HTTP verbs to control our operations. Our MVC APIs usually are set with attributes to indicate the verb as well. A quick way to control that from our applications is to set the allow verb configuration in our web.config file. This overrides the IIS settings for our application. We can do this by setting the following web server configuration. The settings above indicate that we want to allow GET,POST, OPTION and PUT, and DELETE should not be allowed. We also need to remove a WebDAV module and handler that can raise this error as they intercept some of the less common verb like PUT and DELETE. The advantage of doing the changes on the web.config over configuring IIS is that as the application is deployed on any other server/environment; no one has to remember to update that setting on IIS.